We took two of our favorite new leather classes and combined them for one night of fun! 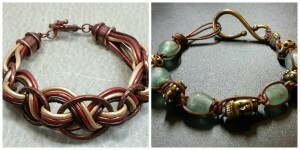 Learn Funky Deanna’s Leather Braid and Funky Shana’s Leather Macrame. Tons of leather colors to choose from to make bracelets that are uniquely you!